Tkachev Brothers A & S.- "Spirng on the Caspian Sea"
Russia's rich cultural heritage represents the best of human creativity. Its literature, music, visual and performing arts and architecture are among the most profound, compelling and beautiful expressions of the human spirit. Much of this rich heritage is well known in the United States, such as the writing of Leo Tolstoy and Fyodor Dostoevsky, the music of Peter Tchaikovsky, Serge Prokofiev and Igor Stravinsky, the painting of Ilya Repin and Vassily Kadinsky, the architecture of the Kremlin and State Hermitage Museum and the dance of the Bolshoi Ballet. Less well known in this tradition of creativity is the painting of the Russian Impressionist period, lasting from approximately 1930 to 1980. Russian Impressionism made an important contribution to the cultural heritage of Russia, but until recently, little has been known of its beauty and quality and its leading artists because of Soviet isolationism. During this period much of the cultural life in the Communist Soviet Union was denied Western exposure. The demise of Communism, the lifting of the Iron Curtain and the movement towards freedom and democracy of the newly formed Commonwealth of Independent States has allowed the world the opportunity to experience a unique and important historical past through the art work. It is now being collected and recognized by art historians, museum directors, curators and collectors as some of the best art produced in the twentieth century. Impressionists in Russia celebrated the common people, depicting their lives, hopes, dreams and emotions in an intimate manner. Instead of incorporating twentieth century western artistic innovations, artists focused deeply on land, people and the new social experiment founded in Mother Russia. Their art was meant to enrich the lives of all people. "We want our art, like the art of the classics, to evoke excitement and love, so that in it people will find an immense vitality of theme, a true mastery of form, force and beauty. Our painting must be rich, sonorous, varied. It must speak of the fate of human beings, their struggles, their remarkable aims. It must assist the birth of great human consciousness, great ideas and strong emotions." There are three primary stylistic branches: Classical - Most literature characterize this painting mode as Soviet academy art. This smooth and low-keyed manner is what we generally believe Soviet art to be like, but in fact this aspect of it might be the least significant. This method produced the smallest number of paintings, though several important artists worked in this style, which held greater influence before the 1950s. Working-Class Impressionism - This gestural manner was typical for most Soviet painters. As it was positive and accessible to the masses, it tended to be the most effective Socialist Realist mode. The window to this world, covers a range of subject matter that includes bucolic vistas and industrialized scenes along with sensitive portraits and still life's. Many of the works glorify the common laborer: steel workers, farmers, milkmaids, builders and loggers. Others depict landscapes, family and social life and a few portray political figures. It reached its zenith during the 1950s and 60s. Rough or Severe Style - Sometimes called ugly or schematic realism, in a sense it was a revival of Modernist elements melded into a generally Realist format imbued with a socialist statement. Stylistically, Russian Impressionism was deeply influenced by many of the characteristics of French Impressionism, including a sense of freedom, spontaneity and vibrant emotion, using heavy brush strokes, light palette, plein aire style and bold color, all translated into a strong, purely Russian sensibility. Depictions of the laboring peasantry by French artists Francois Millet and Gustave Courbet as well as the works of Eugene Boudin and Edouard Manet also influenced the subject matter of Russian Impressionism. Emotionally and intellectually, it grew out of the reactions of Tolstoy, Mussorgsky, Repin and other influential artists to the political upheavals of nineteenth century Czarist Russia and the deplorable living conditions of the common people. A comparison can be drawn to the development of French Impressionism in which the subject matter and style of Courbet, Millet, Manet and other early Impressionists was influenced by social and political upheaval in Western Europe. The result is an increasingly valuable and collectable genre created by outstanding Russian Impressionists. This body of work carries forward the rich cultural heritage of Russia in a style that is historically significant, original in composition and form and beautiful in its depiction of the human spirit. Vasily Nechitailo - "Combiner Andrey Matuznyj"
Until the last decade, Russian Impressionist art was unknown to even the most seasoned collectors and art historians. The art, dating from 1930-1980, was virtually unknown outside the Soviet Union. It wasn't until Perestroika in the early '90s that Westerners discovered its beauty. Given the opportunity now to examine these special paintings, some may be put off by the appellation "Socialist Realism." It conjures up visions of stiff and moribund art that glorified Mother Russia. A careful look at the images, however, challenges such assumptions. The artists were sheltered from Western modernism. Initially they were influenced by 19thcentury French Impressionism. Ultimately they developed a new genre. Uniquely Russian in subject, style and execution, this brand of Impressionism dominated the Soviet art scene for five decades. It yielded one of the most inspired and significant bodies of 20th-century art. Striking sensitivity and expression, our gallery artists captured the souls of a people striving to redefine themselves in an era of great optimism. Whether through the toils of labor, the unadorned beauty of everyday life, or the strength and resilience of her people, Russian painters from the mid-'30s until the mid-'80s left an indelible impression. Dr. Vern Swanson, leading authority on Russian art, called it "the 20th century's leading school of realistic art." In the late 1980s Jim Dabakis, John O'Brien and Alex Dimitriev recognized the artistic and historic merits of Russian Impressionism. They were pioneers in bringing the art to world attention. 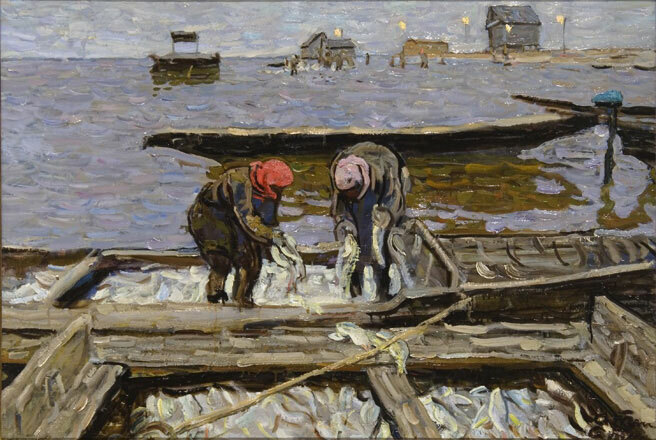 As owners of the Thomas Kearns McCarthey Gallery, along with Thomas McCarthey, they have established an international reputation as a source of superior quality Russian Impressionist paintings. Now, as Russian Impressionism passes through the sales rooms of Asia, Europe and North America and finds its way into the world's museums, the Thomas Kearns McCarthey Gallery is proud to present some of the world's finest examples of Russian Impressionist paintings. From a unique set of circumstances that would be impossible to duplicate, Soviet Art from 1930 to 1980 was the 20th century's major realist school of painting. It powerfully expresses itself with a simple clarity of pictorial language, consummate adeptness and truthful portrayal of life. The Soviet artist acted as a willing collaborator with and portrayer of the aspirations of society. This contrasted with Western models where artists were typically alienated from their community. Acceptance will come, using the Soviet phrase, because it is "historically inevitable". It is already to a certain extent here with the pictures from the period increasingly passing through the sale rooms of Europe and North America. This book should give wider understanding of this underrated but artistically exciting movement in Soviet art. This book is a completely revised and updated edition of Soviet Impressionism, published in 2001 and quickly sold out. Vern Swanson has included a mass of new information as well as 140 additional color plates. Soviet Art of the 1930s to the 1980s is now considered the twentieth century's major realist school of painting, although much of it had remained hidden during its heyday due to the politics of the Cold War. Now percipient and adventurous art historians are turning the balance and addressing the presence of Soviet Impressionist paintings. This is a vibrant and powerful school of art. Beautiful color illustrations throughout and a highly perceptive text make this a reference book no art lover or historian would wish to be without. Vern G. Swanson, Ph. D. is the author of numerous books, catalogues and articles on Soviet painting, 19th century European classicist artists and American realist art. Swanson is the director of the Springville Museum of Art in Utah, USA, and is a graduate of the Brigham Young University and the Courtauld Institute of Art, University of London. Soviet socialist art is one casualty of the U.S.S.R.'s collapse that might have remained unremarked without this book. While monolithic Stalinist portraits are missed by no one, Bown examines the many manifestations of socialist realism, from its 18th-century forebears, through its intellectually charged, if politically constrained, developments through Gorbachev's time. Varying rules of form and content were enforced to fortify socialist ideology and optimism, with even the unsentimental Stalin manipulating the persuasive, moralizing powers of art. Bown's theme of the political obsession with art is indeed fascinating. Abstraction, Fauvism, Cezanne, Picasso and Matisse were all censored by the ideology police until Khrushchev's thaw, an immeasurable privation for artists and public alike. Despite censorship, and the dependency of artists' livelihoods on state endorsement, many revelatory works, showing both exciting innovation and real stylistic flair, emerged within these predominantly figurative genres. The 530 plates (346 in stunning color) of this carefully considered selection include many unfamiliar works from both museums and private collections, making it a commendable and collectable oversized edition. The sole detracting feature is the author's transliterations from the Russian: for example, his insistence on using "Shagal" seems a bit supercilious, when the artist preferred to sign himself as "Chagall." His versions are no more faithful to Russian pronunciation, and are disconcerting to readers accustomed to the "norm." Copyright 1998 Reed Business Information, Inc. The Dictionary is the first work of reference in any language to provide a comprehensive guide to the huge range of painters who worked in the Russia Empire and its successor, the Soviet Union, from 1900 until the last decade of the Soviet Period. From the late 19th to the early 20th century, a group of Russian artists broke away from academic tradition and painted images of Russian landscapes and figures in the French Impressionist style. However, as Russian art historian Guerman points out, the pain and suffering of Russian culture nobly portrayed in its literature is in stark contrast to the brightness and artistic freedom inherent in French Impressionism. Some 140 color illustrations selected from Russian museums and galleries allow readers to compare the two groups of artists. Seeing Russia as a backdrop for French Impressionism is certainly unusual. More importantly, says Guerman, the generally undistinguished works of the Russian group inspired such Russian avant-garde painters as Malevitch and Kandinsky. Although Guerman's ideas are thoughtfully presented, information about the artists is brief. Recommended for comprehensive art collections. Joan Levin, MLS, Chicago. Copyright 1998 Reed Business Information, Inc. The 1860s were marked by a strong realistic movement in Russian painting. Artists became interested in depicting the lives and customs of their fellow countryman. This new art form was mostly the work of the itinerants group, who wanted to take art to the people and paint the outdoors. Mikhail Guerman here traces the converging lines of Russian and French art in the immensely fertile period of the late 19th and early 20th century. The Russian painters of the late 19th and early 20th centuries can be only conventionally called Impressionists. They shared with the famous French artists their free brushwork, use of the color surface with textural effects and particularly painting in the open air, directly from nature. Their oeuvre was marked by craving for good and beautiful which they tried to find in everything. The present edition contains the best works by Russian artists that demonstrate this tendency in Russian art. Hidden Treasures: Russian and Soviet Impressionism 1930s-1970s represents the largest collection of museum quality Soviet and Russian art to be exhibited in a private American museum. From the late 1930s, the Soviet Union commissioned its preeminent artists to create on canvas the Utopia they believed Communism would achieve. For more than 40 years, these artists painted with passion, making their contribution to furthering the cause. For this reason, this art has an inherent honesty that confirms its unique historical importance. Representing the work of some 75 artists, the subject matter ranges from bucolic vistas and industrialized scenes to sensitive portraits and still lifes. Many glorify the common laborer: steelworkers, farmers, milkmaids, and loggers; while others depict family and social life, with a few portraying political figures. Any political message is obscured or lost altogether in most of these paintings, which stand on their own artistic merit and historical significance. Impressionism flourished in Russia from its inception and for decades after, but who knew? As art historian and State Russian Museum curator Kruglov writes, Russian impressionist painting is "an unknown and underrated phenomena." This groundbreaking volume, which contains 340 glowing illustrations of work by 140 artists (all concisely profiled), puts an end to this neglect and presents the legions of art lovers who possess a seemingly insatiable appetite for impressionistic works with a whole new universe to explore. Both Kruglov and his colleague, Lenyashin, offer enlightening historical overviews that compare and contrast these diverse Russian painters with each other and with their European and American counterparts, and chronicle their struggles for recognition. The paintings themselves are fascinating. Russian painters tended to wield a heavier hand and use a darker palette than other impressionists, and, although their subject matter is similar, the ambiance and details are distinctly Russian, thus revealing a world long hidden from outsiders. Perhaps the most beloved art movement of all time, Impressionism had its roots in France but soon inspired artists around the world. This new book documents that explosion in Russia, unveiling canvases that resonate with the pure color, sparkling light, and lively depictions of everyday life that characterize Impressionism at its best. Chosen from the holdings of the State Russian Museum in St. Petersburg, the works displayed in this handsome volume focus on a chapter in Russia's rich cultural history that has been too long overlooked. Now, the broad range of Russian Impressionism is made abundantly clear in 340 lush color plates and in illuminating essays. The superb paintings, most rarely or never published before, make this collection an essential addition to any art lover's library. VLADIMIR KRUGLOV, an art historian and leading curator at the State Russian Museum, has published extensively on the history of Russian art. VLADIMIR LENYASHIN is currently head of the late 19th- and early 20th-century painting department at the State Russian Museum and is a professor at the Ilya Repin Institute of Painting, Sculpture, and Architecture in St. Petersburg. The book is a first inclusive publication on the history of the Leningrad School, one of the brightest and significant phenomena in the Soviet Art of 1930-1980 that strongly influenced its contents and development. The book outlines basic periods of the school's evolution from the period that preceded its formation in the early 1930s up to the early 1990s. Paintings reproduced in the publication belong to large Russian and foreign private collections, some of the works are published for the first time. This allows for a renewed and more comprehensive assessment of the art heritage of individual painters and the epoch in general. The publication contains a Historical outline, artists' biographies and photographs and an extensive reference section that helps to navigate the book materials and provides the reader with important historical guidelines. Texts are published in Russian and English. Published in St. Petersburg by Russian Painting Collectors' Club. Text by Sergei V. Ivanov. Limited, 450 pages, 343 color plates with numerous black and white photographs of artists. Hard cover with cloth and gold stamping, 12,7 x 10 inches. Historical outline. Chronology of the Leningrad School. Index of more than 1200 painters. Artists' Biographies and Bibliography of the Leningrad School of Painting. This extensive dictionary of painters, sculptors, printmakers, and stage designers covers a vast time in varying depth; there appears to be no book in English of comparable scope or currency. Entries range from one line to several pages, with stage designers getting the most detailed treatment. Very brief analyses of individual works are given within larger biographies "to help identify artists' styles and characteristics." Bibliographies are included in most entries, although references are frequently to materials that are uncommon. The 20-page introductory essay is a breathless tour of half a millennium's development, but this will be an excellent addition to the reference shelf, particularly for lesser-known artists in a field of increasing interest.